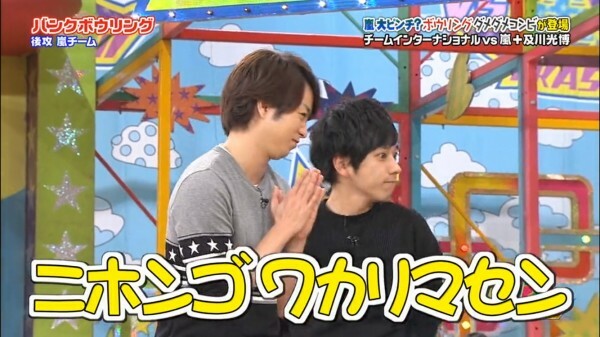 As Ninomiya said on Vs Arashi back in March of this year, "Nihongo Wakarimasen". And this was to be my first hurdle in becoming a full-time, fangirling, Arashian. I didn't understand Japanese! When I started watching Vs Arashi on SBS Television, I had subtitles to help me. It's hard to explain but back then I just took it for granted that I understood what they were saying because watching subtitles was second nature to me. I am a lover of foreign films from France, Germany, Spain, Japan, and Korea. But when I branched out and started watching and listening to Arashi's music/pvs and live concert DVDs, I came undone. Suddenly I had no subtitles to help me! Why did I stick with it and become obsessed anyway? That's a good question. I will get to that in a minute (I hope). In all seriousness though, I have honed, crafted and nurtured my very own deep and special love of Japan and the Japanese language through watching doramas and movies. As I have had fifteen plus years of Arashi to catch up on, I have had a mighty long list of shows to watch - for each member! I still have a long way to go but so far I have watched Aiba, MatsuJun, Ninomiya, Ohno and Sakurai shine beguilingly on my television screen (All thanks to lovely people who are kind and patient enough to subtitle them all). My growing love and interest has even expanded to non-Arashi Japanese actors, and subsequently it's been months since I watched an English-speaking movie! I can't fully explain it but my all-consuming love for Japan and the Japanese culture really blossomed out of watching Arashi members' doramas and movies.